Celebrated between the months of October and November according to the Gregorian calendar, Diwali is the hindu Festival of Lights celebrated throughout India and other countries where the Hinduism is practiced. The name derives from Deepvali, the 5 days festivities that have its main point in the third day, known as Lakmish Pujan, the celebration of the goddess of wealth and prosperity, Lakmish. Diwali is also a festival of indulgence, having food as one of its main aspects, so it’s not uncommon that families prepare a large variety of sweets and other delicious treats to serve their guests. Food varies according to the different regions but are definitely rich in variety and types, making it irresistible to try. Given the country wide popularity of the festival, it is celebrated by people with a wide spectrum of traditions and religious backgrounds, having many temples and public spaces lit up with candles that represent the path of lights that gives the name Festival of Lights. 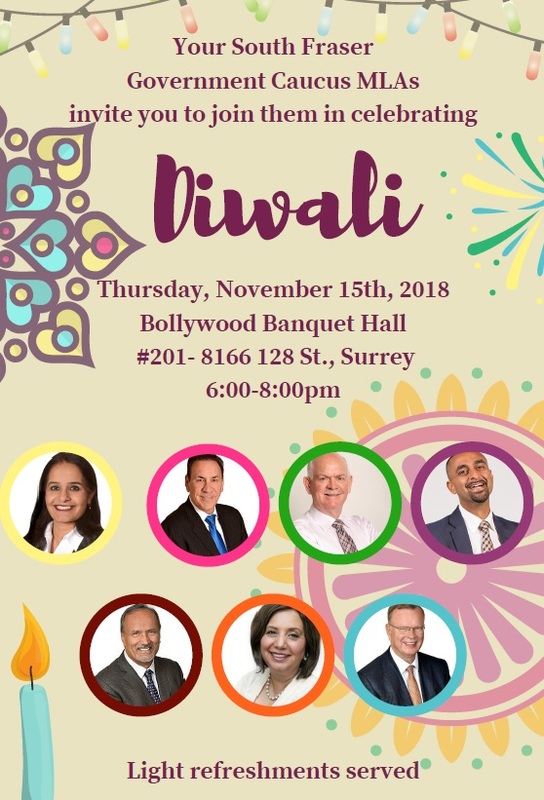 On Thursday, November 15th the Surrey community is invited to attend the Diwali festivities hosted by the South Fraser Government MLAs at the Bollywood Banquet Hall at 8166 129 Street from 6:00 to 8:00pm. Come meet your Member of Legislative Assembly and fellow constituents and enjoy delicious dishes and light refreshments being served.